Even before the trailer of 'Ek Ladki Ko Dekha Toh Aisa Laga' dropped, the film has been in the news for it is the first collaboration between the father-daughter duo, Anil and Sonam Kapoor. The unconventional film also marks the reunion of the veteran actor with Juhi Chawla after a period of nineteen years, that promises to send across an important social message. So was the film able to break through the glass ceiling of conventional films? Read here. The film starts with a classic wedding scene, with vicenarian Sonam Kapoor (Sweety) and her family in attendance, where all her relatives can talk about is 'when will Sweety's wedding take place'? However, Kapoor seems quite uninterested in the topic and focusses on enjoying the event. Cut to the next scene, Sonam Kapoor (Sweety) meets a vivacious girl, Regina Cassandra (Kuhu), who approaches her with the sole purpose of setting her brother up. In the events that follow, Sonam (Sweety) can be seen enjoying the boy's company, but there is one major problem and that is the fact that the boy belongs to a Muslim background. Sonam Kapoor's brother, Abhishek Duhan (Babloo) however, suspects that something is not right and keeps a close eye on her. Enter Rajkummar Rao, (Saahil Mirza) a struggling writer, who is looking for 'inspiration', who ends up meeting Sonam (Sweety) while she is trying to escape her brother Abhishek Duhan (Babloo). 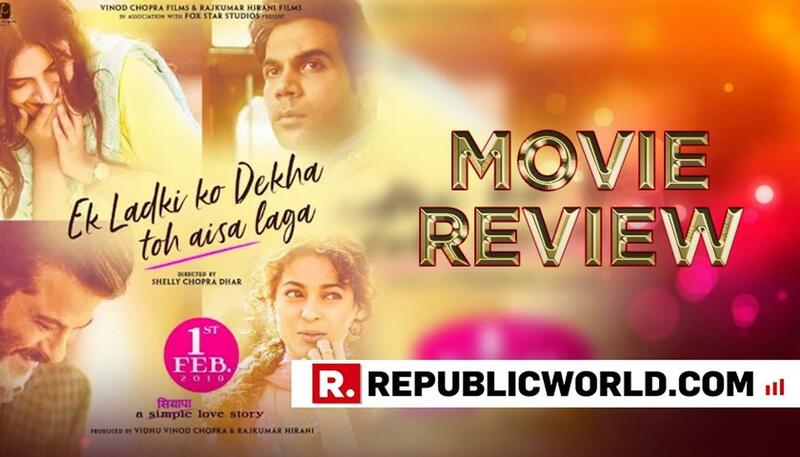 One can say, that it is 'love in first sight' for the writer, who then ends up following Sonam (Sweety) to her home town in Moga in order to pursue her as a love interest, and also find the inventiveness he is looking for. However, things take a wild turn, when he gets stuck with Sonam's middle-class family and a secret that upsets his plan of action. The interesting part of the film is that there is a play within, which forces the audience to face the long-suppressed realities and confront their prejudices. The film is like a breath of fresh air, which sends across an important social message with the right amount of entertainment. Anil Kapoor, Sonam Kapoor and Juhi Chawla shine through this saga. The story is quite simple and told in a manner that achieves something bigger than what a Bollywood crowd-pleaser can. It projects the film in such a way, that prompts the audience to think differently without deviating from the main purpose, that is to send across an important message with a pinch of entertainment. Sonam Kapoor portrays her role in quite a convincing manner, while Anil Kapoor and Juhi Chawla maintain the pace of the film, with their light-hearted moments. Rajkummar Rao is as perfect as usual, and an absolute delight. What works: Exceptional performance by the lead cast and light-hearted humour brings life in this otherwise serious story. What does not work: Emotional hook points could be more nuanced.